Respect had always been shown between Conor McGregor and UFC lightweight champion Khabib Nurmagomedov whenever they saw each other at events or fought on the same card. But the tension between the two started backstage before the weigh-ins at UFC 205 when McGregor headlined against Eddie Alvarez and Nurmagomedov faced Michael Johnson. They were separated backstage by security after McGregor started to walk towards Nurmagomedov, who was talking trash at the Irishman. Things escalated during the week of UFC 223 when Nurmagomedov and his fight team surrounded McGregor teammate and good friend Artem Lobov at the fight hotel in Brooklyn. It resulted in Nurmagomedov slapping Lobov in the back of the head. After hearing what happened, McGregor, who had been scheduled to be in town to announce a UFC 224 clash with Rafael dos Anjos for the interim welterweight title, flew in early with a group of associates. They stormed into the loading dock in the Barclays Center and McGregor tossed a dolly through a bus window, injuring two UFC fighters. In McGregor’s mind, it was the incident with Nurmagomedov and Lobov that began the feud and led him to return from a nearly two-year hiatus to challenge Nurmagomedov for the belt at Saturday’s UFC 229. 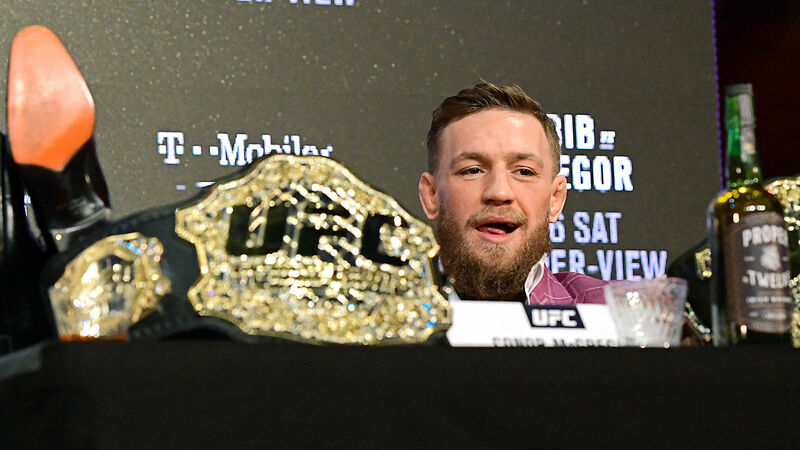 “Many people come around and they cannot last around me and this lifestyle and around the true fight game and true fight preparation,” McGregor said on Ariel Helwani’s MMA Show. “If it wasn’t for Artem giving me all of himself, I wouldn’t be where I’m at. He was the one willing to step inside the Octagon and help me prepare for bouts, even backstage. He was able to help me prepare for bouts. “If it wasn’t for him, I wouldn’t have been able to reach the levels I needed to reach to get to this level that I’m at now. Artem has done a lot for me over the years. After saying he said he wanted to move on in the interview, the 30-year-old went on a tirade about the UFC lightweight champion. “The man’s a fake rat,” McGregor angrily said. “You know what kind of people they are. You know yourself, you know who you’re managed by, you know the way they are, you know what kind of people they are. F— every single one of them. Every single one of them can get it. Of McGregor’s 21 career victories in mixed martial arts, 18 have ended up in a knockout. Like he does before all of his fights, McGregor made a prediction. The soon-to-be father of two believes due to the Nurmagomedov’s weaknesses, he will be KO No. 19. “I believe KO, devastating KO,” McGregor exclaimed. “But I hope it’s not too early to be honest. I believe I will clobber him and he will crumble. I don’t believe he can take a smack. Lot of people think the fight hinges on whether he can take a smack and whether he has the chin of (Nate) Diaz or the composure of a (Floyd) Mayweather.